Over the years, people are continually asking me what color my puppies are or what color is this dog or that dog will be. 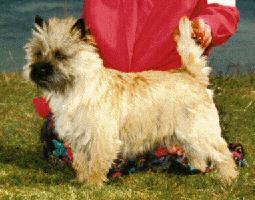 Well, with Cairn Terriers, your guess is as good as mine!!!! 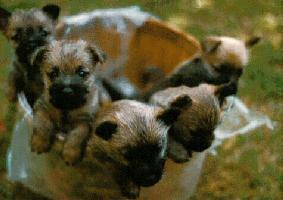 The puppies start out as one color and end up another, then by the time they are 3 or 4 years old, they are another. 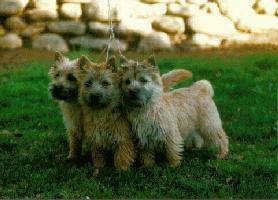 To steal a phrase from good old Forrest Gump, Cairn Terriers are like a box of chocolates; you never know what you will get! 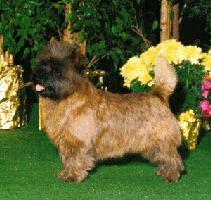 Any of my dogs that have just a small amount of brindling I call pre-black! Look at Telli, pictured below. 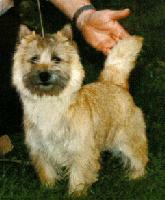 As a puppy she was a bright red wheaten with very dark points and one small dark "smudge" mark on her back. 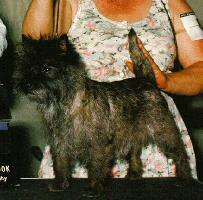 By the time she was 3, she was a very dark brindle. Over the years I have become "known" for my red dogs. 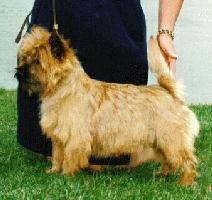 If anyone hears a prospective puppy buyer say that they want a red Cairn, they are sent to me. The one thing I will not guarantee is COLOR!! Below are some pictures of my dogs as they have gone through their color changes. Some of these dogs I could have sworn would not change others are very typical and yes, I have used mainly red dogs to get my point across! Ch. 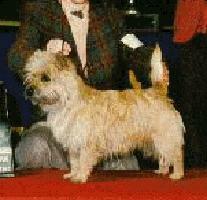 Rose Croft Kestrel Abh and Ch. Rose Croft Aon Cullean Abh.